We usually talk of energy in general terms, as in “I don’t have a lot of energy today” or “You can feel the energy in the room.” But what really is energy? Where do we get the energy to move? How do we use it? How do we get more of it? Ultimately, what controls our movements? The three metabolic energy pathways are the phosphagen system, glycolysis and the aerobic system. How do they work, and what is their effect? Albert Einstein, in his infinite wisdom, discovered that the total energy of an object is equal to the mass of the object multiplied by the square of the speed of light. His formula for atomic energy, E = mc2, has become the most recognized mathematical formula in the world. According to his equation, any change in the energy of an object causes a change in the mass of that object. The change in energy can come in many forms, including mechanical, thermal, electromagnetic, chemical, electrical or nuclear. Energy is all around us. The lights in your home, a microwave, a telephone, the sun; all transmit energy. Even though the solar energy that heats the earth is quite different from the energy used to run up a hill, energy, as the first law of thermodynamics tells us, can be neither created nor destroyed. It is simply changed from one form to another. 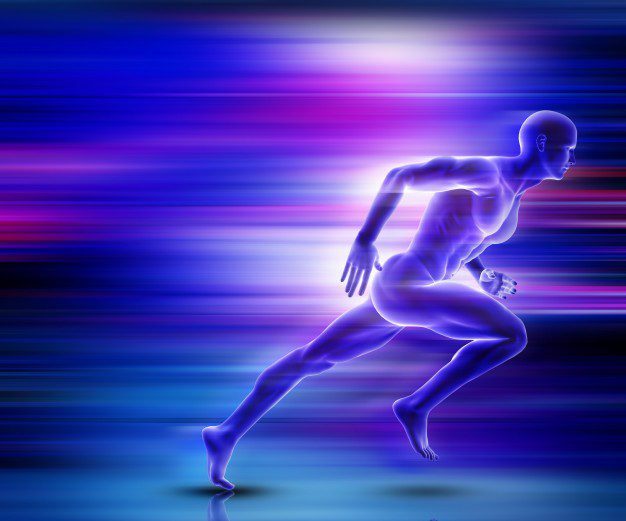 The energy for all physical activity comes from the conversion of high-energy phosphates (adenosine triphosphate—ATP) to lower-energy phosphates (adenosine diphosphate—ADP; adenosine monophosphate—AMP; and inorganic phosphate, Pi). During this breakdown (hydrolysis) of ATP, which is a water-requiring process, a proton, energy and heat are produced: ATP + H2O —© ADP + Pi + H+ + energy + heat. Since our muscles don’t store much ATP, we must constantly resynthesize it. The hydrolysis and resynthesis of ATP is thus a circular process—ATP is hydrolyzed into ADP and Pi, and then ADP and Pi combine to resynthesize ATP. Alternatively, two ADP molecules can combine to produce ATP and AMP: ADP + ADP —© ATP + AMP. Like many other animals, humans produce ATP through three metabolic pathways that consist of many enzyme-catalyzed chemical reactions: the phosphagen system, glycolysis and the aerobic system. 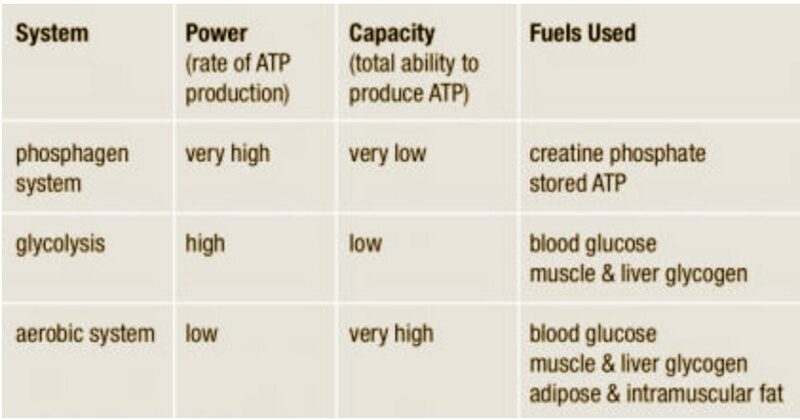 Which pathway your clients use for the primary production of ATP depends on how quickly they need it and how much of it they need. Lifting heavy weights, for instance, requires energy much more quickly than jogging on the treadmill, necessitating the reliance on different energy systems. However, the production of ATP is never achieved by the exclusive use of one energy system, but rather by the coordinated response of all energy systems contributing to different degrees. During short-term, intense activities, a large amount of power needs to be produced by the muscles, creating a high demand for ATP. The phosphagen system (also called the ATP-CP system) is the quickest way to resynthesize ATP (Robergs & Roberts 1997). Creatine phosphate (CP), which is stored in skeletal muscles, donates a phosphate to ADP to produce ATP: ADP + CP —© ATP + C. No carbohydrate or fat is used in this process; the regeneration of ATP comes solely from stored CP. Since this process does not need oxygen to resynthesize ATP, it is anaerobic, or oxygen-independent. 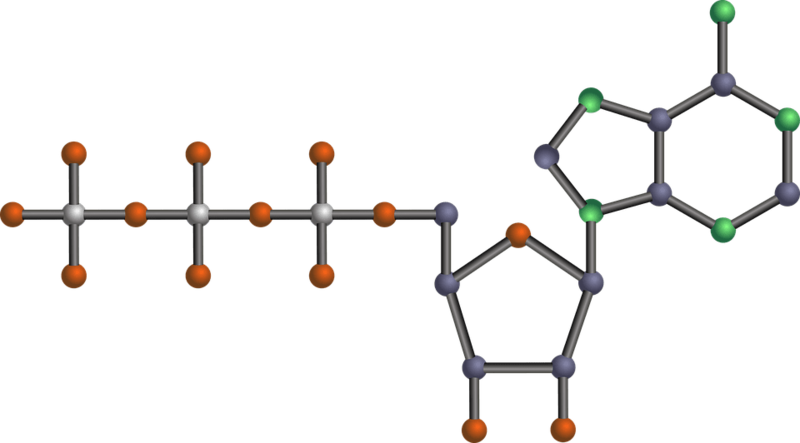 As the fastest way to resynthesize ATP, the phosphagen system is the predominant energy system used for all-out exercise lasting up to about 10 seconds. However, since there is a limited amount of stored CP and ATP in skeletal muscles, fatigue occurs rapidly. Glycolysis is the predominant energy system used for all-out exercise lasting from 30 seconds to about 2 minutes and is the second-fastest way to resynthesize ATP. During glycolysis, carbohydrate—in the form of either blood glucose (sugar) or muscle glycogen (the stored form of glucose)—is broken down through a series of chemical reactions to form pyruvate (glycogen is first broken down into glucose through a process called glycogenolysis). For every molecule of glucose broken down to pyruvate through glycolysis, two molecules of usable ATP are produced (Brooks et al. 2000). Thus, very little energy is produced through this pathway, but the trade-off is that you get the energy quickly. Once pyruvate is formed, it has two fates: conversion to lactate or conversion to a metabolic intermediary molecule called acetyl coenzyme A (acetyl-CoA), which enters the mitochondria for oxidation and the production of more ATP (Robergs & Roberts 1997). Conversion to lactate occurs when the demand for oxygen is greater than the supply (i.e., during anaerobic exercise). Conversely, when there is enough oxygen available to meet the muscles’ needs (i.e., during aerobic exercise), pyruvate (via acetyl-CoA) enters the mitochondria and goes through aerobic metabolism. When oxygen is not supplied fast enough to meet the muscles’ needs (anaerobic glycolysis), there is an increase in hydrogen ions (which causes the muscle pH to decrease; a condition called acidosis) and other metabolites (ADP, Pi and potassium ions). Acidosis and the accumulation of these other metabolites cause a number of problems inside the muscles, including inhibition of specific enzymes involved in metabolism and muscle contraction, inhibition of the release of calcium (the trigger for muscle contraction) from its storage site in muscles, and interference with the muscles’ electrical charges (Enoka & Stuart 1992; Glaister 2005; McLester 1997). As a result of these changes, muscles lose their ability to contract effectively, and muscle force production and exercise intensity ultimately decrease. The aerobic system—which includes the Krebs cycle (also called the citric acid cycle or TCA cycle) and the electron transport chain—uses blood glucose, glycogen and fat as fuels to resynthesize ATP in the mitochondria of muscle cells (see the sidebar “Energy System Characteristics”). Given its location, the aerobic system is also called mitochondrial respiration. When using carbohydrate, glucose and glycogen are first metabolized through glycolysis, with the resulting pyruvate used to form acetyl-CoA, which enters the Krebs cycle. The electrons produced in the Krebs cycle are then transported through the electron transport chain, where ATP and water are produced (a process called oxidative phosphorylation) (Robergs & Roberts 1997). 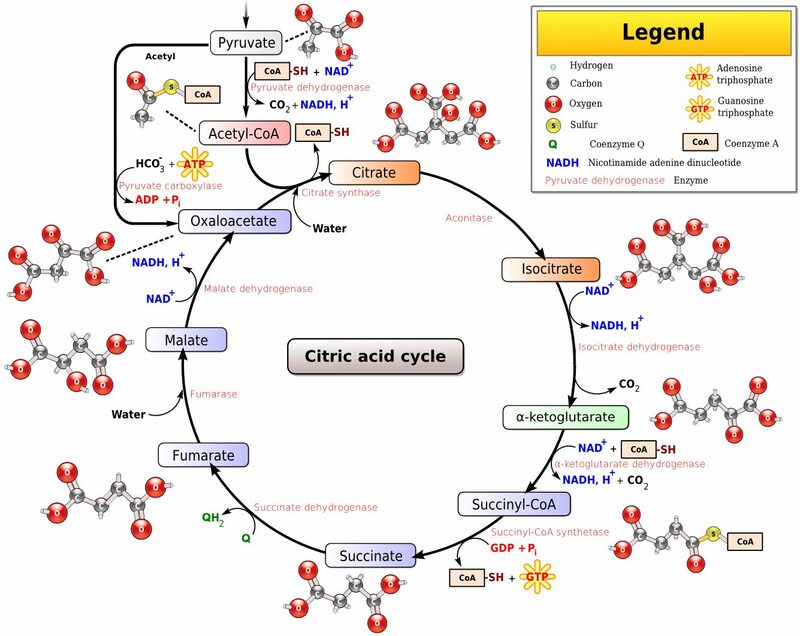 Complete oxidation of glucose via glycolysis, the Krebs cycle and the electron transport chain produces 36 molecules of ATP for every molecule of glucose broken down (Robergs & Roberts 1997). Thus, the aerobic system produces 18 times more ATP than does anaerobic glycolysis from each glucose molecule. Fat, which is stored as triglyceride in adipose tissue underneath the skin and within skeletal muscles (called intramuscular triglyceride), is the other major fuel for the aerobic system, and is the largest store of energy in the body. 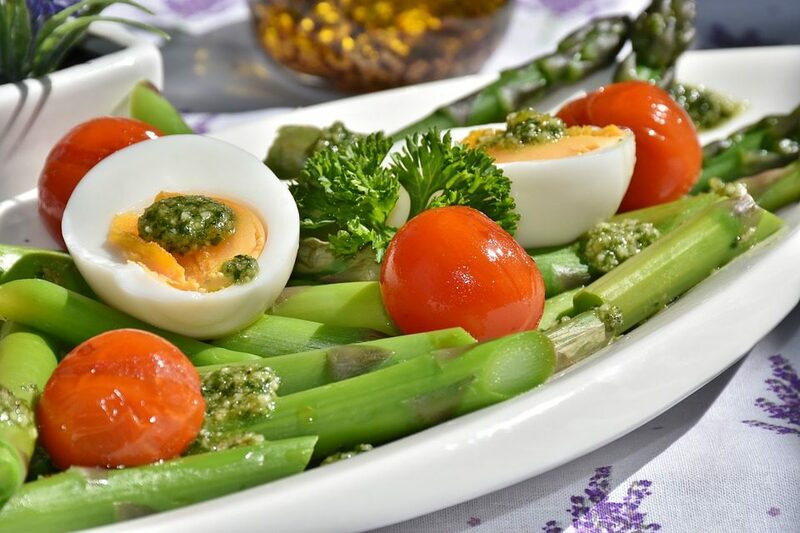 When using fat, triglycerides are first broken down into free fatty acids and glycerol (a process called lipolysis). The free fatty acids, which are composed of a long chain of carbon atoms, are transported to the muscle mitochondria, where the carbon atoms are used to produce acetyl-CoA (a process called beta-oxidation). Following acetyl-CoA formation, fat metabolism is identical to carbohydrate metabolism, with acetyl-CoA entering the Krebs cycle and the electrons being transported to the electron transport chain to form ATP and water. The oxidation of free fatty acids yields many more ATP molecules than the oxidation of glucose or glycogen. For example, the oxidation of the fatty acid palmitate produces 129 molecules of ATP (Brooks et al. 2000). No wonder clients can sustain an aerobic activity longer than an anaerobic one! Understanding how energy is produced for physical activity is important when it comes to programming exercise at the proper intensity and duration for your clients. So the next time your clients get done with a workout and think, “I have a lot of energy,” you’ll know exactly where they got it. 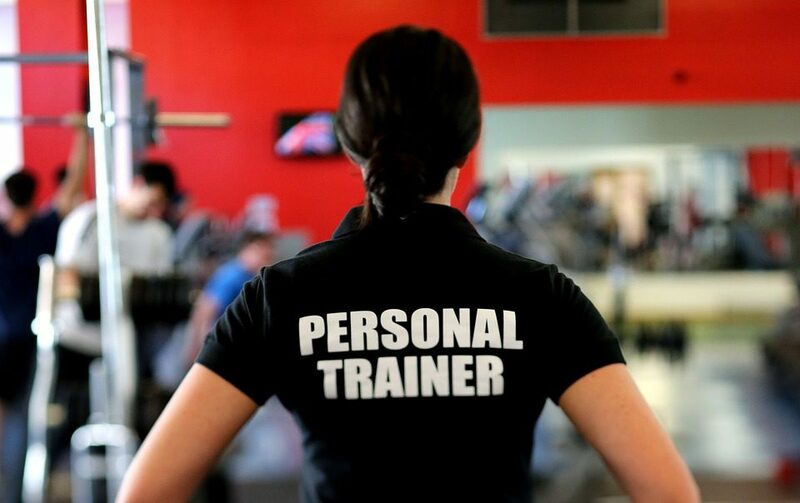 Have clients warm up and cool down before and after each workout. An effective workout for this system is short, very fast sprints on the treadmill or bike lasting 5–15 seconds with 3–5 minutes of rest between each. 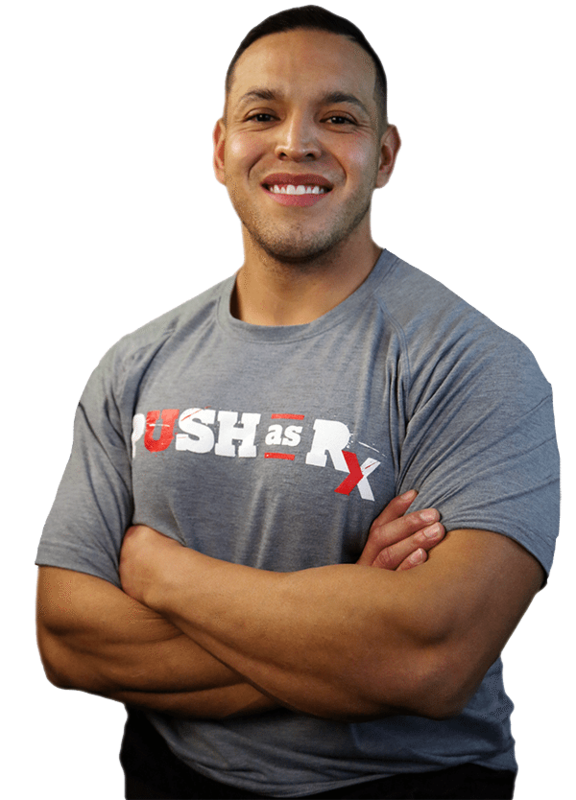 The long rest periods allow for complete replenishment of creatine phosphate in the muscles so it can be reused for the next interval. This system can be trained using fast intervals lasting 30 seconds to 2 minutes with an active-recovery period twice as long as the work period (1:2 work-to-rest ratio). While the phosphagen system and glycolysis are best trained with intervals, because those metabolic systems are emphasized only during high-intensity activities, the aerobic system can be trained with both continuous exercise and intervals. Brooks, G.A., et al. 2000. Exercise Physiology: Human Bioenergetics and Its Applications.Mountain View, CA: Mayfield. Enoka, R.M., & Stuart, D.G. 1992. Neurobiology of muscle fatigue. Journal of Applied Physiology, 72 (5), 1631–48. Glaister, M. 2005. Multiple sprint work: Physiological responses, mechanisms of fatigue and the influence of aerobic fitness. Sports Medicine, 35 (9), 757–77. Hochachka, P.W., Gunga, H.C., & Kirsch, K. 1998. Our ancestral physiological phenotype: An adaptation for hypoxia tolerance and for endurance performance? Proceedings of the National Academy of Sciences, 95, 1915–20. Hochachka, P.W., & Monge, C. 2000. Evolution of human hypoxia tolerance physiology. Advances in Experimental and Medical Biology, 475, 25–43. McLester, J.R. 1997. Muscle contraction and fatigue: The role of adenosine 5′-diphosphate and inorganic phosphate. Sports Medicine, 23 (5), 287–305. Robergs, R.A. & Roberts, S.O. 1997. Exercise Physiology: Exercise, Performance, and Clinical Applications. Boston: William C. Brown.